The manufacturing and processing of food products for human and animal consumption is a huge industry that continues to grow. This industry includes beef, pork and poultry processing, dog and cat food, sugar refining, wet corn milling, coffee processing and the manufacturing of ice. KWS designs and manufactures equipment specially designed for the food industry. Our food grade conveyors are perfect for food products used for human consumption. Highly polished stainless steel construction with no pits or crevices is our standard for the industry. The equipment used for non-human consumption for the processing of beef, pork and poultry require very heavy-duty construction to handle the meat by-products. Rendering converts waste animal by-products into stable, value added materials as diverse as animal feed and biodiesel. KWS builds high quality, engineered solutions to address the abrasive and corrosive environments found in the Rendering Industry. KWS lined the inlet and discharge areas with UHMW to improve bulk material flow. The bulk bag unloading system provided by KWS included an incline screw feeder with hopper and supports. KWS designed and manufactured a one of a kind, low profile multi-screw feeder as the perfect solution. 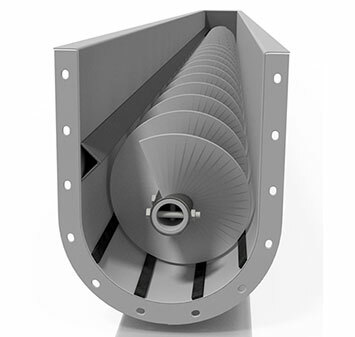 KWS provided a reversible screw feeder with a central inlet, which proved to be the ideal solution. The engineers at Keebler and KWS developed an excellent solution for their snack production process.